The Walking Dead showrunners have revealed a major casting decision that will undoubtedly please readers of the graphic novel. The sixth season of The Walking Dead has been raising a lot more questions than it has been providing answers. Is Glenn Rhea dead? Is Alexandria doomed? Will Morgan ever accept that his newfound philosophy on "the preciousness of life" is dangerous bordering on insane? How did Deanna manage to raise such cowardly sons? Why can't walkers just chill out every now and again? But mystery has always been a big part of how The Walking Dead operates. It's a show that keeps an airtight lock on script details and upcoming storylines to keep its audience guessing and/or incredibly pissed off week after week. It's a show that makes you watch an hour-long show after it is over just to see a 30-second clip of *next* week's show -- a clip which you could easily find online the next morning, FWIW -- AND YET YOU WATCH IT ANYWAY. Which is what makes today's news regarding a major casting/story development so satisfying. According to The Hollywood Reporter, The Walkiing Dead showrunners have finally cast their Negan, a.k.a the baseball bat-wielding ultra-baddy from the comic book series: Jeffery Dean Morgan. Comic book fans will already recognize Morgan as as Edward Blake/Comedian in Watchmen (pictured above). 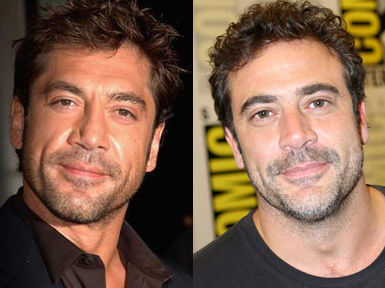 Non-comic book fans will recognize him as "that dude who looks exactly like Javier Bardem." The character, who sources say will first arrive in the season six finale directed by Greg Nicotero, is the violent leader of a group known as The Saviors who use force and intimidation to subjugate other communities - including Alexandria. Negan first appears in the landmark 100th issue when he crosses paths with Rick Grimes, who had been vocal about bringing down the man who takes half the community's supplies in exchange for "protection" from walkers. Morgan will first join the series as a guest star before being promoted to series regular for season seven. Production on the season six finale begins this week in Atlanta. 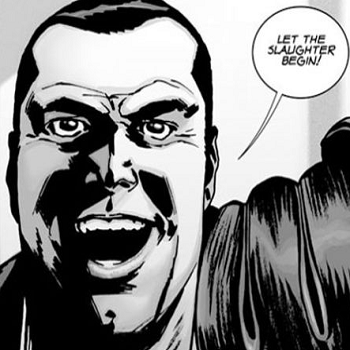 Of course, with the man Negan makes an example of in his comic book introduction currently presumed dead on the show, the question becomes: Who will Negan introduce Lucille to first?